The value of sharing knowledge accrues to authors and readers alike. Here are some examples. Authors of all articles, case studies, papers, reports and other works published in the PMWJ will receive full credit and recognition with each work submitted. Recognition will include author name under title of paper, full author profile at the end of each article, name in the header, and copyright notice in the footer. Authors will receive further recognition in the PM World Library. Author visibility will include name listing in table of contents, on title page of each submitted work, in the author profile at the end of each paper, and in the AUTHOR SHOWCASE section of the PM World Library. Each author will be offered a personal AUTHOR SHOWCASE web page where her or his works will be visible and accessible. Visibility increases with the number and range of works published by PM World. Authors of new P/PM knowledge deserve serious respect from everyone. Authors will receive respectful treatment from the editors and publishers of the PMWJ at all times. We request that all readers respect the authors and their original works, and refrain from copying or referencing their works without appropriate recognition. 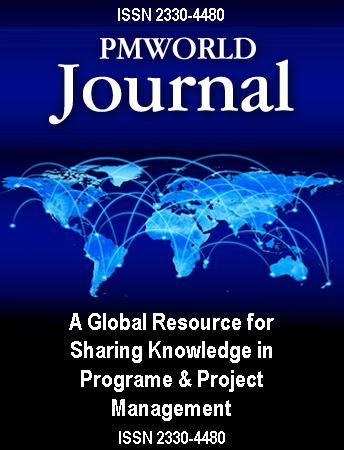 Authors of original works published in the PMWJ can claim professional development units (PDUs) from the Project Management Institute (PMI®) for Project Management Professional (PMP®) recertification, and from other professional organizations that allow continuing education credits for publishing. For information, contact your professional society. The recognition and visibility that result from authoring and publishing articles and papers, and especially sharing useful knowledge, can be good for your business. Whether you are a consultant, educator, trainer or employee of a large corporation, your organization will gain visibility and credit from your published work. Authors of advisory articles and case studies, where solutions to real problems are described, are often recognized as experts and solution providers. Authors of serious research or featured papers can establish themselves as experts in the topics of their papers. Well written and original works often provide evidence of expertise or leadership in the field. The sharing of useful P/PM knowledge or information can lead to powerful and positive results. If your article, paper or case study can be used by someone in the world to manage a program or project more successfully, the impact can be significant. If the program or project is important, affecting the lives of multiple stakeholders, then you can anticipate the gratitude of many people. We expect many of our authors to receive emails from grateful readers. It’s not all about the authors though. Think about the readers! Here are some benefits that we expect readers to realize. Readers can gain access to real world solutions by reading advisory articles, case studies, stories and educational articles and papers. These can lead to tangible benefits for individuals and organizations, and especially for those new to the P/PM field, for organizations where P/PM is not yet mature, and in locations around the world where modern P/PM is newly introduced. For students, educators and those new to the field, we hope the PMWJ can provide new knowledge and information about both basic and advanced P/PM. Students will find educational articles and papers about many aspects of P/PM around the world. Educators can find useful resources to supplement coursework, complement specific topics or provide ideas or opportunities for research. Those new to the field and those with many years of experience can simply learn more. And at no cost each month! No one person knows everything about P/PM, regardless of their experience level. With the wide range of industries, conditions and environments where programs and projects are implemented today, it is impossible to learn everything from experience alone. New applications and solutions occur in organizations and industries that can be applied elsewhere; experts and practitioners worldwide gain knowledge and experience that can be applied in other locations. New applications and knowledge continue to be developed in the P/PM field, through research and application. Continuous learning is needed in this field and requires that we learn from others. The PMWJ is intended to be a global resource for continuous learning. Access to more P/PM knowledge, experience and information should increase the success rates of programs and projects where such knowledge and information can be applied. We believe that learning from others, benchmarking against the approaches and experiences of other managers and organizations, gaining knowledge about what has worked elsewhere, will increase the probability of success wherever that knowledge or information can be applied. In some locatons and in many organizations, project success means improving lives and changing the world for the better. We hope the PMWJ can contribute to positive change! Share your P/PM knowledge and experience. The process might help someone somewhere solve a problem, have a positive impact on someone’s life, or help achieve important results better, faster, cheaper. Make a difference in the world. Share your knowledge. Submit an article or paper for publication today.